We’ve all read those awestruck reports about a couple of aging cigar industry giants sitting down to swap smokes and stories. Well, the other evening, two self-described “little guys” in the business got together to do much the same. They had a ball and so did everyone else in attendance. 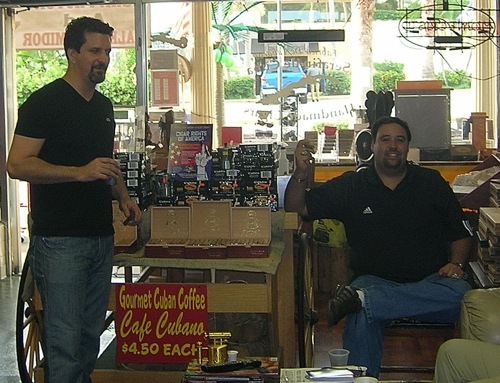 Frank Herrera (left) handed out samples of his just-released 1608 La Caridad del Cobre cigars at Arnold Serafin’s (right) small shop on the main tourist strip in Tarpon Springs, Florida. Herrera’s boxes nestled on a table near Serafin’s own brand—Serafin de Cuba—rolled right there. It was a hastily arranged affair, but one that says a lot about the determination of cigar lovers who want to make their mark despite perilous economic times and harsh anti-smoking laws. The two men met last month at the IPCPR Trade Show in New Orleans where Herrera introduced his cigars. When Serafin learned that Herrera, a Miami lawyer, would be in Tampa for his fulltime job, he convinced him to join him in nearby Tarpon Springs. Serafin invited customers, ordered pizza, poured drinks, and helped set up a domino game. Herrera’s cigars are expertly constructed, memorable smokes. He hopes to have a maduro out before long. And he’s working to expand the number of shops that carry La Caridad del Cobre. When we met, he was planning an event at Our Cigar Bar, a Diamond Crown Lounge shop in Orange Beach, Alabama. Serafin traces his Cuban cigar heritage back for generations. His father helps in the shop and rolls some small sticks. They’re especially popular with tourists looking for a quick smoke as they stroll the street lined with Greek shops and restaurants. Serafin’s primary torcedor, who rolled in Cuba before coming to the U.S., turns out several hundred cigars a week, working at the shop on Fridays, Saturdays, and Sundays, as well as at the many private events where they appear. Serafin buys tobacco from the Oliva Tobacco Co. in Tampa and works to produce a relatively mild, tasty, and smooth blend at a reasonable price. With his shop approaching its second anniversary, Serafin clearly enjoys his work. He loves meeting customers, wants them to try his cigars and to tell him honestly what they think. In addition to Serafin de Cuba, Serafin’s comfortable shop features some mainline brands and quite a few other boutique cigars. His online business continues to grow, he said, as more snowbirds order after returning North. It’s hard not to get caught up in the enthusiasm of these young generation cigar makers. And they reward you with a fine smoking experience. Great Story. I wish both gentlemen great success and can't wait to try their cigars. I live in NW Florida and will try to attend the October 25 event in Orange Beach AL. I'm sure you'll have a great time. From talking to them briefly on the phone and checking their site, OCB looks like a terrific place. Mr. Ferrara- If ever in Tarpon Springs, It would be a pleasure to see you at my shop. Thank you for your kind words!! Great story, always wonderful hearing about the little, local guys. Thankyou relating to supplying this unique greater information. We wants expressing an item along with our own pals along with online community. You should definitely always be up-date in your web page, now i am day-to-day client connected with the web page. give thanks all over again.